The new Ford Kuga is bigger and more practical than the car it replaces. The second-generation of this SUV also promises to be a pleasure to drive, with a choice of diesel and petrol engines, as well as front-wheel- and four-wheel-drive versions. Here at Practical Caravan, we tested a model that looks well-suited to towing: the 2.0 TDCi 163 Titanium Powershift. The engine in this car is the most powerful in the range, while four-wheel drive should help cope with muddy pitches and greasy Tarmac. The Powershift automatic gearbox should come into its own for hill starts and in stop-start traffic. 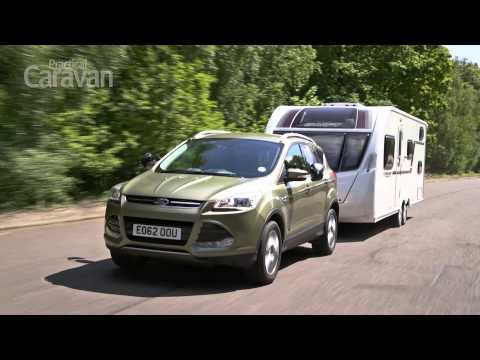 Read our Ford Kuga review to find out what tow car ability it has. Most new cars are lighter than their predecessors – not necessarily good news for tow car drivers. However, the Ford Kuga bucks the slimming trend by having grown considerably since its first generation. The car on test has a kerbweight of 1707kg, which is a few kilos more than the equivalent model in the original Kuga line-up. That gives a reasonable 85% outfit match figure of 1451kg. By increasing in size and weight, the Kuga has stepped away from small and more wieldy 4x4s, such as the Volkswagen Tiguan, and towards the Honda CR-V, Hyundai Santa Fe, Mitsubishi Outlander and other larger SUVs. It rivals these with a legal towing limit of 2100kg and a healthy towball limit of 105kg. The testers matched the Kuga with an unladen Swift Challenger Sport 636 that had a mass in running order (MiRO) of 1470kg, and put the Ford to the test on the road and at the test track. The Kuga had no trouble pulling such a heavy twin-axle van (although it was unladen, it was an 86% match). With 251lb ft of torque, it pulled the Swift from 30-60mph in 13.7 seconds. That’s more than respectable. Throughout the test drive, we were impressed by the way the Kuga held speed on steep hills and always had performance in reserve. In Drive, the Powershift gearbox was sometimes slow to change down a gear, but this was easily cured by selecting ‘Sport’ mode, which made the gearbox more willing to drop a ratio and more inclined to hold a lower gear. The brakes felt strong and were easy to apply smoothly in normal driving. However, in the emergency braking test the car needed 11.4m to stop from 30mph on a bone-dry track. That’s a reasonable performance, but plenty of cars tested by Practical Caravan have stopped in shorter distances. The Kuga was expected to perform well in the emergency lane-change test, but the Ford didn’t quite deliver the confident performance the we had anticipated. The steering was precise and well weighted, but the front tyres began to push wide relatively early. On high-speed runs, the caravan began to push the back of the car around. This may have been due partly to the tyres. The test car was supplied with mud and snow (M+S) tyres, which are designed to work on a mixture of surfaces and at a variety of temperatures. These promise better performance on muddy campsites than conventional summer tyres, but pushing them hard on Tarmac on a dry, warm day didn’t show them at their best. Mud and snow tyres are standard fit on the Kuga, unless the buyer chooses the optional larger alloys, in which case the Kuga comes with summer rubber. In any event, the testers had no nervous moments when towing less aggressively on the public road. The Ford made up ground in the hill-start test. The handbrake held the outfit still on the 1-in-10 slope so long as it was tugged firmly. Pulling away was fuss-free, and with plenty of torque to call upon, the Kuga was as happy reversing up the hill as it was going forwards. In almost every respect the Ford Kuga is an impressive tow car, but its showing in the lane-change test – at least when using the M+S tyres – was disappointing. If anything, the Ford Kuga is more impressive as a solo drive than as a tow car. Although it leans if pushed hard in corners, it feels agile and responsive. That’s especially true of other versions we have driven with summer tyres but, even with the compromised rubber fitted to this test car, we found the Kuga enjoyable to drive at safe and sensible speeds. The steering is direct and has more feel than that of most rivals, and the car proved well-balanced in high-speed bends. It’s certainly more fun to drive than a Honda CR-V or a Mitsubishi Outlander. Lively handling hasn’t been achieved at the expense of ride comfort. Ford’s engineers have done a good job of fine-tuning the suspension, which is controlled but supple. We resisted the temptation to specify larger alloys than the 17in wheels fitted to the test car. This decision no doubt helped take the edge off lumps and bumps in the road surface. Without the weight of a caravan to pull, the 161bhp engine has an easy time bringing the Kuga up to speed, although it does sound a bit strained if you rev it hard. As when towing, the Powershift gearbox sometimes takes a while to grab a lower gear, but the gear-selector buttons on the side of the gearstick let the driver take charge. The ‘Sport’ mode is much more decisive than ‘Drive’. At motorway speeds, any engine noise stays in the background, and wind and road noise aren’t excessive. Long journeys in the Kuga should be no chore. It’s a shame that all-round visibility isn’t better, though. The windscreen pillars are very thick, so you’ll need to take care at junctions. Otherwise, few SUVs of this size and price are as enjoyable to drive. The new Ford Kuga is 81mm longer than the old version, providing room for a larger cabin. But while anyone trading up from the previous model will be impressed, the Kuga faces some very practical rivals and can only just compete. There’s no problem in the front of the car, with plenty of head and legroom. Drivers of most shapes and sizes should be able to get comfortable, because there’s plenty of adjustment for the seat and steering wheel. There’s a rest for your left foot, too – something missing from too many cars. In the back seats, there’s good and bad news. The floor is almost flat, which provides room for everyone’s feet, even when carrying three passengers. Air vents in the centre of the car should keep everyone cool, and the rear seats can be reclined for a more relaxed position. However, the legroom is no better than adequate. There’s much more room to stretch out in a Honda CR-V, for example. The story in the boot is similar. It’s a good, square shape and there’s no load-lip over which to lift items. However, 456 litres of space (or 406 litres with a compact spare wheel rather than a repair kit) is meagre when compared to the Honda’s 589 litres. In isolation, the Kuga is practical enough – but many rivals offer more. The Hyundai Santa Fe, Kia Sorento and Mitsubishi Outlander all have more flexible cabins and space for two more passengers. A Ford Kuga 2.0 TDCi 163 Titanium Powershift will cost £27,050. At least, that’s what a dealer will ask for, but this should drop to £25,254 after haggling. You’ll save more if you go for the manual gearbox. Not only is the asking price £1500 less, but the manual is more economical, returning 47.9mpg on the combined cycle compared to 45.6mpg for the Powershift auto. However, both these figures are comfortably beaten by the Mitsubishi Outlander. When towing the Challenger Sport on our economy route, the Kuga achieved just 20.9mpg. Low insurance premiums should help offset the cost of fuelling the Ford. Its group 21 rating is five groups lower than the equivalent Honda. Resale values are also strong, so you can expect the car to hold on to 49% of the original asking price after three years and 36,000 miles. The warranty ends after three years or 60,000 miles. That’s shorter cover than you’d get from Hyundai or Kia, but it’s on a par with most European brands. The Kuga has a five-star rating from the safety experts at Euro NCAP, and the Titanium comes well equipped. The Kuga is strong on safety with competitive resale values, but this must be balanced against a limited warranty and so-so economy. We found a lot to like in the Ford Kuga. It may look a bit straight-laced when compared with the original model, but in most ways, what matters is that this is the better car for caravanners. The old Kuga was cramped inside. This version is much bigger, with worthwhile improvements in luggage and passenger space. However, it’s now at a size and price point to compete against bigger SUVs than its predecessor, and compared with these rivals the Ford is no more than adequate. You can buy 4x4s with more passenger space and perhaps two more seats for similar money. It’s not hard to find cars with more luggage space either. The Kuga isn’t the most economical car in its class. We’re talking about only a few mpg, but if the official figures can be believed, the Mitsubishi Outlander and other rivals will cost less to fuel. If you want a heavyweight tow car to pull a big twin-axle van, then either the Hyundai Santa Fe or the Kia Sorento may suit you better. That said, aside from a slightly below-par lane-change test, the Kuga towed very well. Performance from the 161bhp diesel engine is strong, and it is stable on motorways. Where this Ford really scores, though, is in solo driving. Most of its rivals are sensible, practical cars but rather bland to drive. The latest version of the Kuga is much more enjoyable, offering sharp handling, positive steering and punchy overtaking. Is that enough to outweigh the Kuga’s shortcomings in other areas? It’s really a question of priorities. But as much fun as the Kuga is to drive, there are better all-rounders.